Provolone is an Italian cheese that originated in Southern Italy, where it is still produced in various shapes as in 10 to 15 cm long pear shapes, cheesesausage shape or cone shape. A variant of Provolone is also produced in North America and Japan. The most important Provolone production region is currently Northern Italy. Left: Provolone Dolce Cheese from Italy. 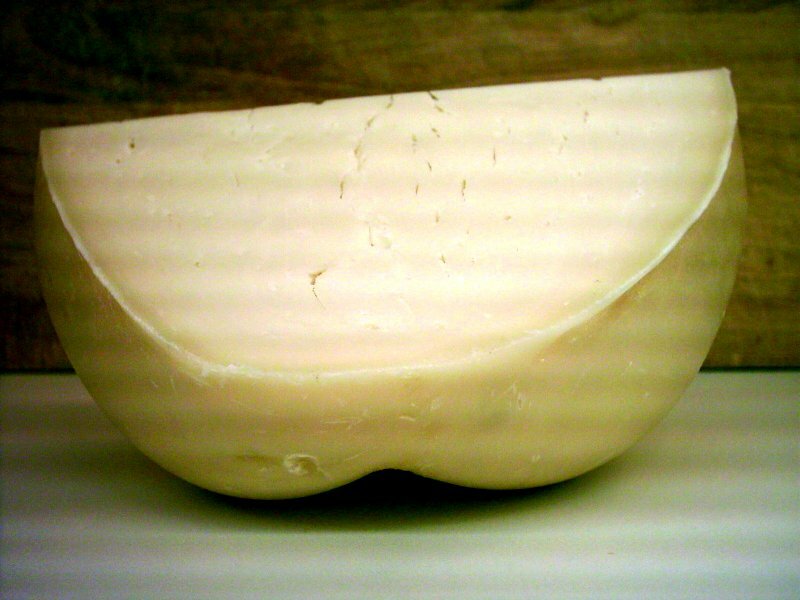 The term Provolone (meaning large Provola) appeared around the end of the 19th Century when it started to be manufactured in the Southern regions of Italy, and this cheese assumed its current large size. The smaller sized variant is called Provola and comes in plain and smoked ("affumicata") varieties. Provolone is today a whole-milk cow cheese with a smooth skin produced mainly in the Po River Valley regions of Lombardia and Veneto. It is produced in different forms: shaped like large salami up to 30 cm in diameter and 90 cm long; in a watermelon shape; in a truncated bottle shape; or also in a large pear shape with the characteristic round knob for hanging. The average weight is 5 kg. In Brazil, Argentina and Uruguay, small discs of locally-produced "Provolone" of 10 to 15 cm in diameter and 1 to 2 cm in height are generally consumed before eating grilled meat. The Provolone is either placed directly on the grill, on small stones or inside a foil plate and cooked until melted. The provoleta is seasoned with "chimichurri", a mixture of oils and spices, and usually eaten communally.